Well, now that Valentine’s Day is out of the way, let’s get back to focusing on the ridiculous instead of the romantic, shall we? February’s line-up at Sidekick Comedy is another cracker-jack of a bill. £2 in or FREE with student card. Downstairs at Via on Canal Street. P.S. The comic shop prize this month is AMAZING. It’s so good, my wife won’t even let me keep it as it damages our home aesthetics! 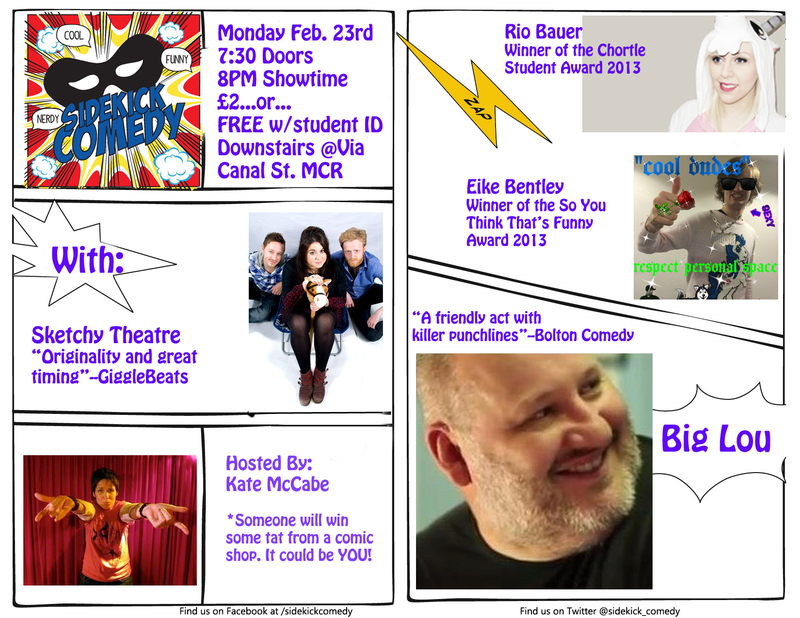 This entry was tagged Alternative Comedy, Big Lou, Canal Street, Comedy, Comedy in Manchester, Eike Bentley, Kate McCabe, Rio Bauer, Sketchy Theatre. Bookmark the permalink.